Ahah! The origin of 'RoadKing' is revealed. Nice bike! Had a moped when I was a teenager...A little different. But it looked like a real motorcycle...LOL! 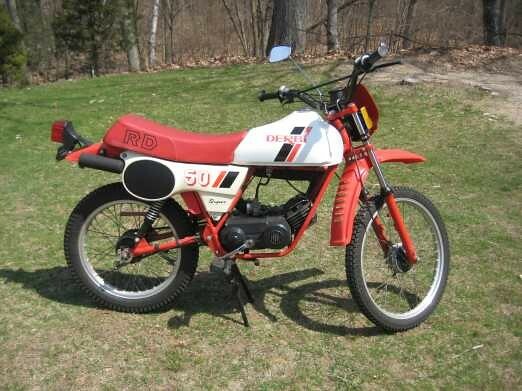 Aside from moped, my brother had a 80 something Suzuki GS850 which he let me put a few miles on. I never got a bike license or owned my own real motor cycle though. This was the worst part so far. It looks worse in pics than it actually is. I had a little bit of work making the curve just right across the seam. 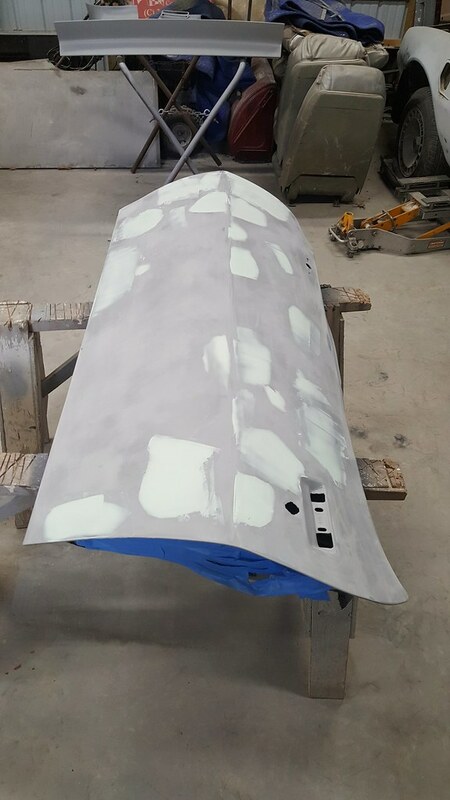 I put layout lines 6" apart coming from the tail panel. Did the same on the driver side with the factory quarter. I then used a contour gauge at each spot, setting the correct curve with the dr. side and transferring it to the pass side. After priming with the 2k I use a long block sander to find the hollows and knock off the high spots. The hollows show up in darker spots. You can see some of them here. Overall the body was pretty straight, but the door had a number of issues. From my limited experience the doors seem to take on the brunt of all the abuse. I have prob twice the amount of work on this door alone than the rest of the car. I then use a glazing putty to fill the minor imperfections (hollows) found in the previous step. These spots aren't really all that bad but will def show up in the final paint. 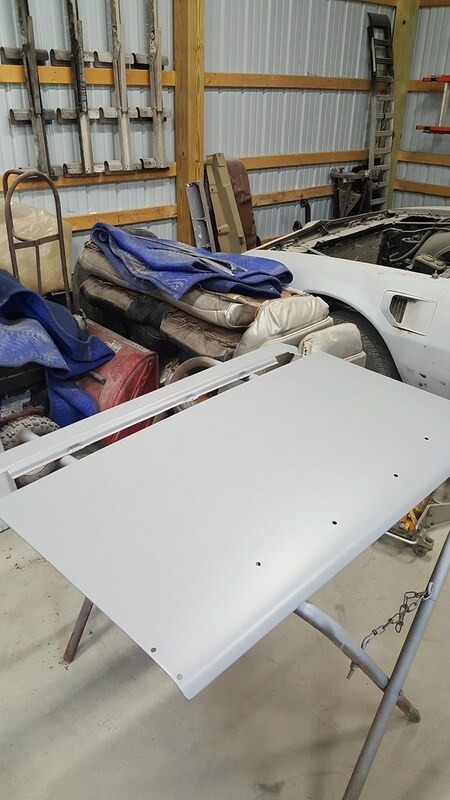 I did get a couple more coats of primer back over, and every thing is a nice uniform coat of grey again. Most of you may have a better, or 'correct' way to do this, I figure I will post for those who may be looking for an amateurs advice. 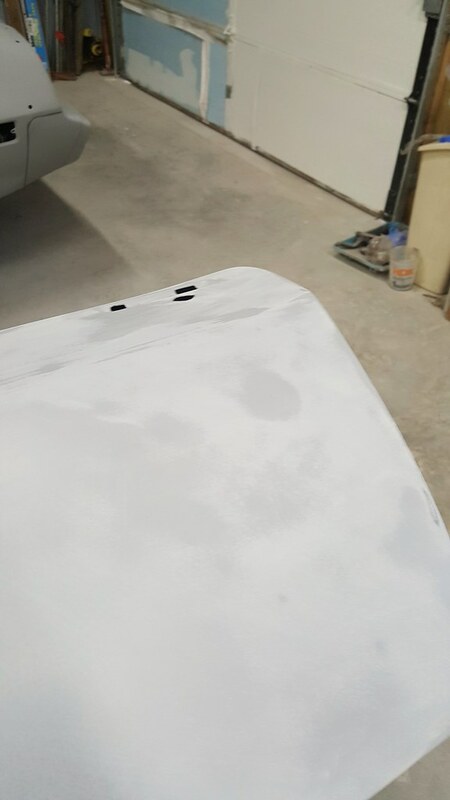 Im not sure if this is the right way to do it, but this is the technique I used on my black car and it came out ok. I have seen where people use guide coats but I just stick with the long sanding blocks and it seems to work out ok.
Next step: I got a hinge rebuild kit off of ebay and will repair the dr side hinges, then re-install that door. 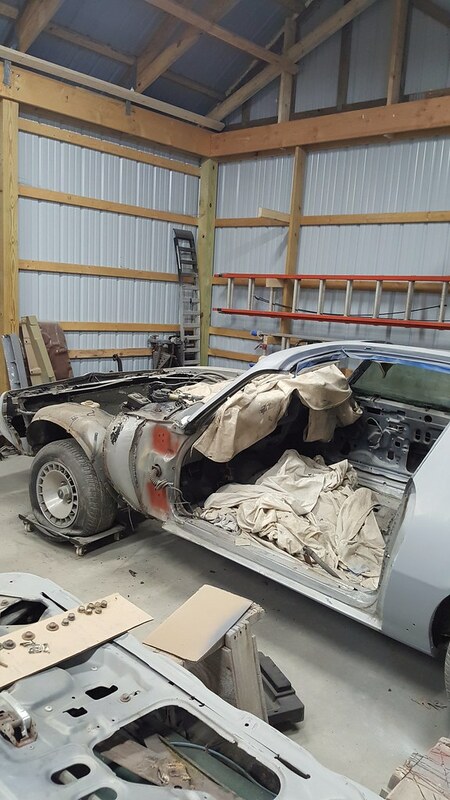 Turn the car around and start to work on the front end, fenders, and take the pass door off and work on that. Hoping to get to the hinges this evening. Great work Kerry you are moving right along I pretty much use the same technique that you use but I will use a guide coat. 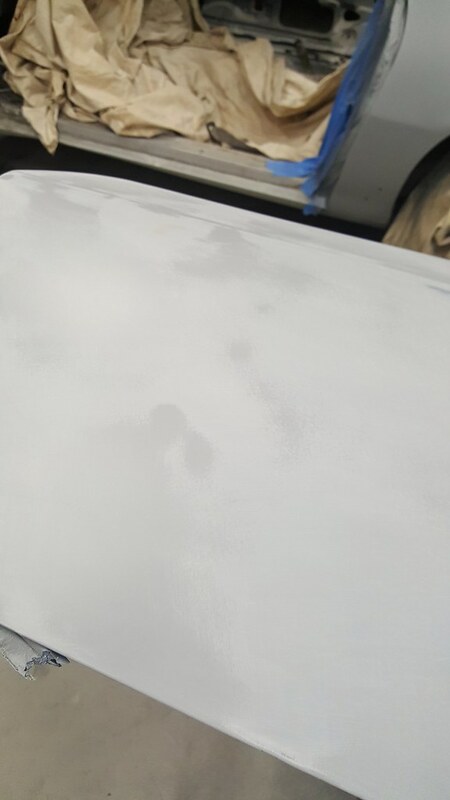 Just don’t use Rust-Oleum that stuff sands like concrete trust me I know as I did this past weekend on a hood. Like to had killed my hands and shoulders! Door looks good! 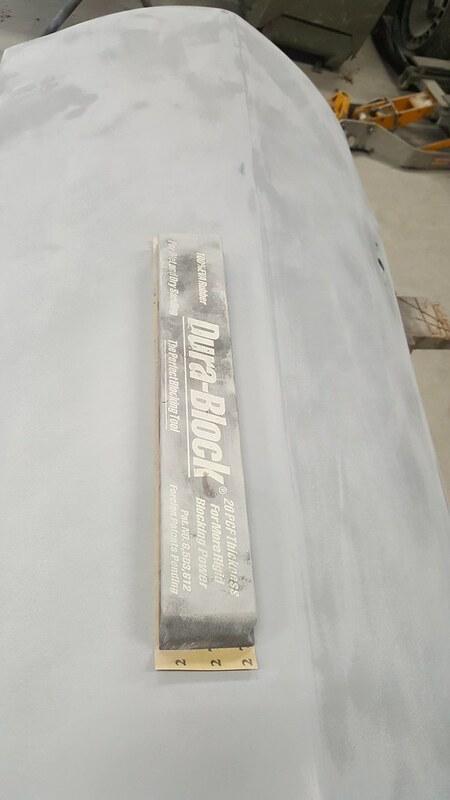 I use a guide coat as well, cheapest paint I can find at Lowes. I also use SPI 2K Epoxy which has a high sheen and makes finding low spots easier. Doors can be a huge PITA if the style line has a crease or dent in it, I spent many an hour on my doors while on stands only to spend even more time touching up the gaps when fitting. Good work Kerry! It's cool you can spray your own car. I'm going to push for a detached garage in the next few years. I'm hoping that I can start doing some side jobs to bring in a little extra cash. Maybe some LS swaps, or quick paint jobs. Looks like professional work to me! Way to go. Looking really good! 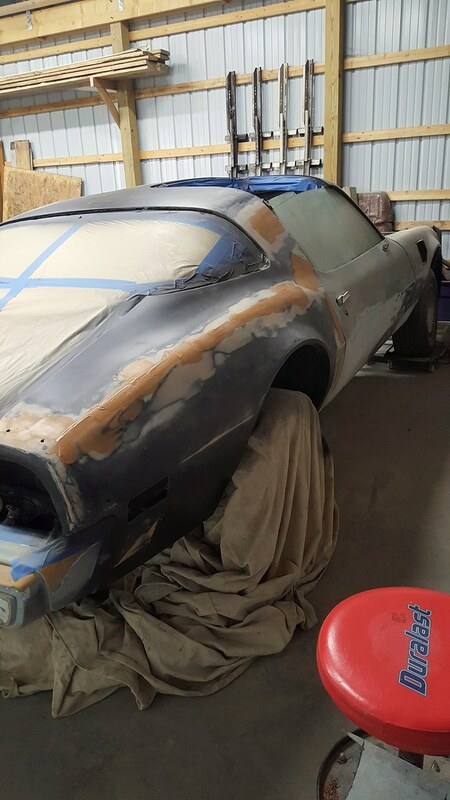 I am tempted to start learning to do paint and body work, and your thread is encouraging me in that direction! Looks like really great work! 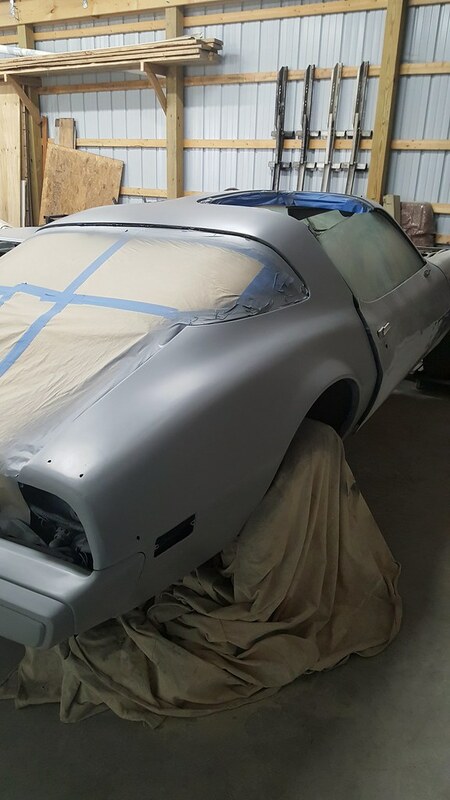 Thanks Jim, I really enjoy doing body work and painting. Although im not even near the same league as your paint guy. This kind of stuff is my therapy. Im not real mechanical (yet) so I still have to rely on someone for that part. If I couldn't do most of it myself I couldn't afford this hobby! LOL. Wow, that looks great, your really making some good progress! The way I see it is that there are two types of people, some that pay others to restore and others learn and do it themselves. Although it's unreasonable to assume everyone can do everything but the types that at least try to learn and do it themselves are the true hobbyist. I wanted to re do the hinges before I re-install the door. Bushings were shot. I got a rebuild kit off ebay for $14, enough for all 4 hinges. They came apart easy, spring came out easy, media blasted, primed and painted. THEN, I had a heck of a time getting the spring installed. 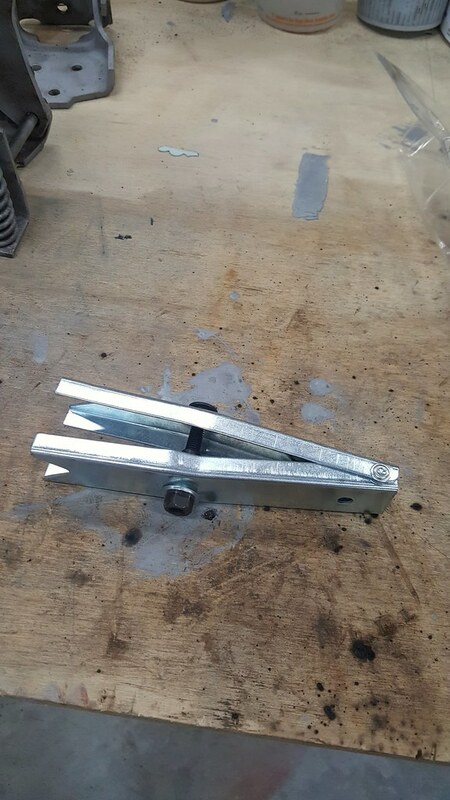 I looked online and found a spring compressor so I decided to make one out of stuff I had laying around. MAJOR FAIL! SO, today I stopped at AZ and found one for $16, took all of about 1 minute to install it with the right tool. Next step is getting the door jamb cleaned and painted, then re-install the door. I find it fascinating how a tool you make works great for a lot of jobs but then there are few of those spots where you need to buy something. Stripped the t top frames down and prepped. 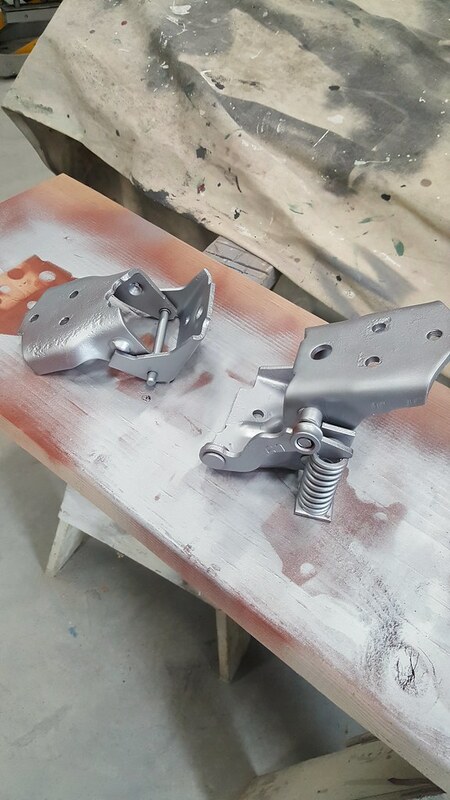 The dr side had some surface rust not too bad, the pass side looks like it just the factory, paint still shines. Started to take the front end apart. Not as much fun as I remember. I got my paint yesterday, gonna pick up some clear on Monday and then I will start putting some colour on. Wow, I have been doing a lot of work around the condo complex and have gotten way behind on the builds! 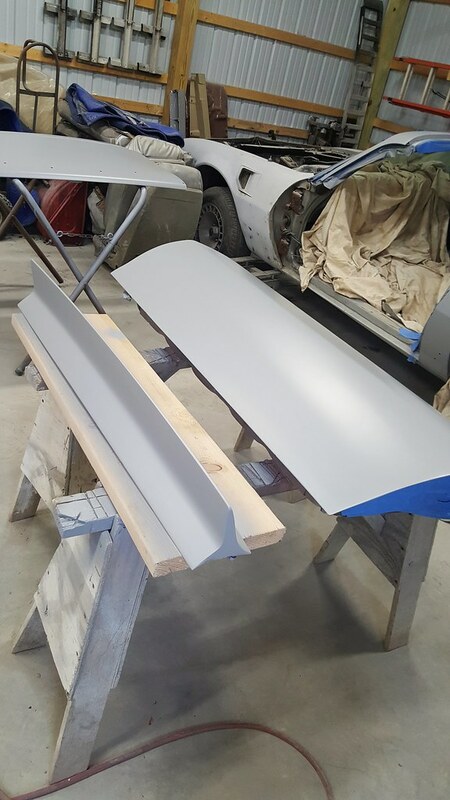 First, great job on the t-top interior trim panels. Mine are cracked at the corners as well. 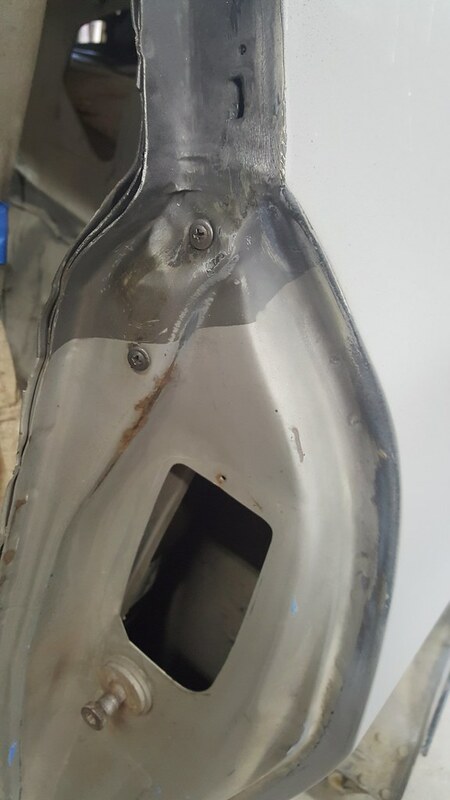 I would never thought of using fiberglass to repair them, although I have done fiberglass repairs before. At $109 apiece (GM at Ames), it is definitely worth it! The console also looks fantastic. Who would have thought you could repair that? Was that SEM number for the warm gray supposed to be 15183 not 1583? That is a perfect match, I am going to purchase it. 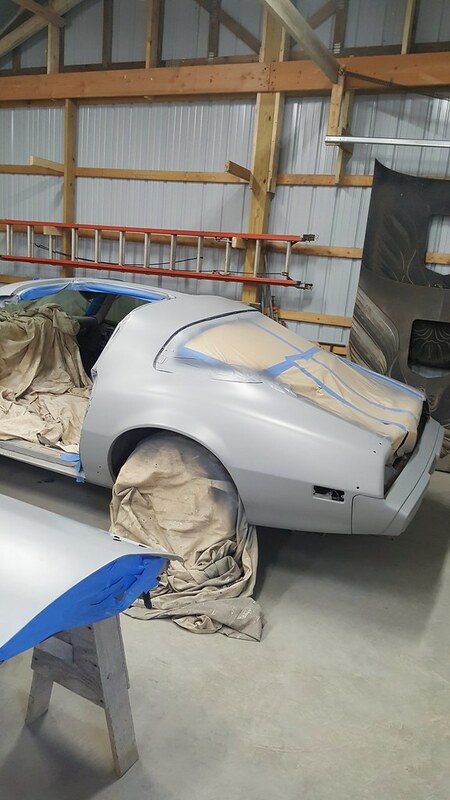 Your paint work is turning out really good! I found using the light gray primer works well with the silver paint. 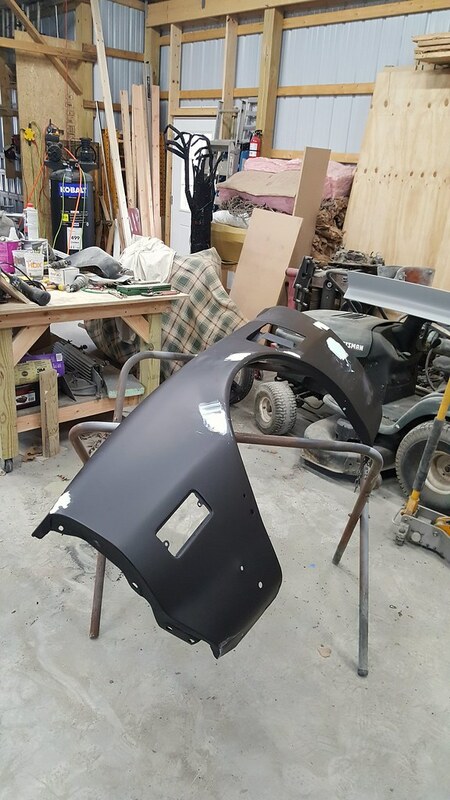 Did you end up getting your paint for spraying at Automotive Touchup or somewhere else? It was really surprising when I pulled off my door hinges and found no paint underneath. No wonder they were rusting there. Congratulations on all your recent progress, you have accomplished much! 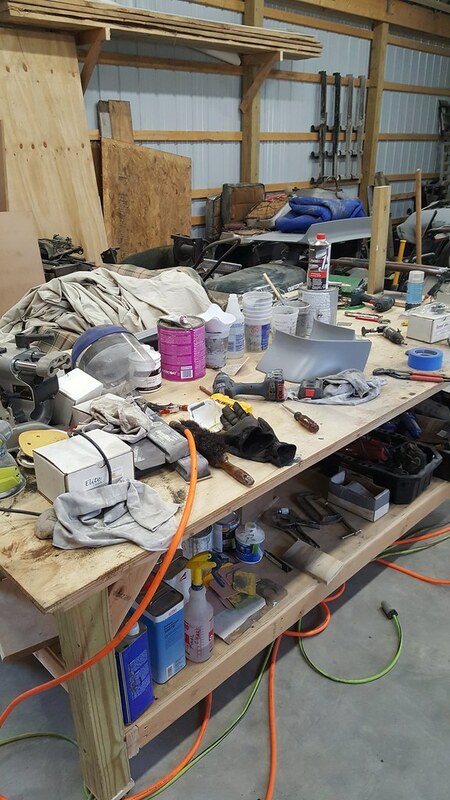 There was a comment on another thread about neatness in the shop. This is my current work table!! pulled everything out of the way, sanded down and primered the top rail areas. 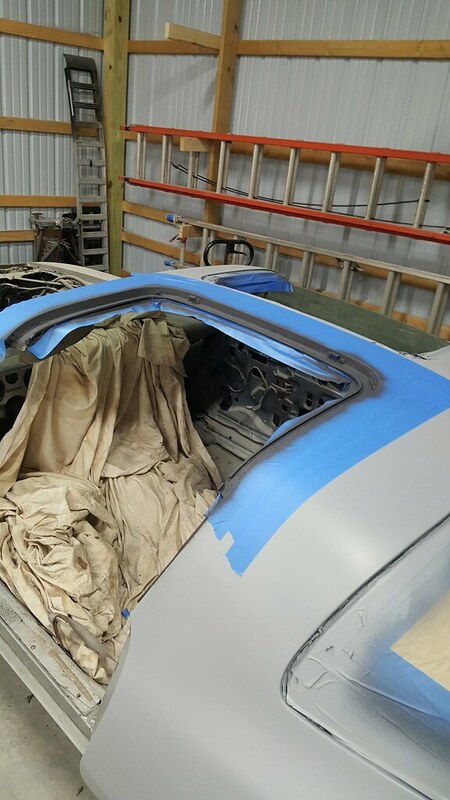 This is the pass side, factory paint still shiny. Dr. side had a bit of surface rust but nothing major. Another curiosity. I have little reason to think the door has been removed previously. 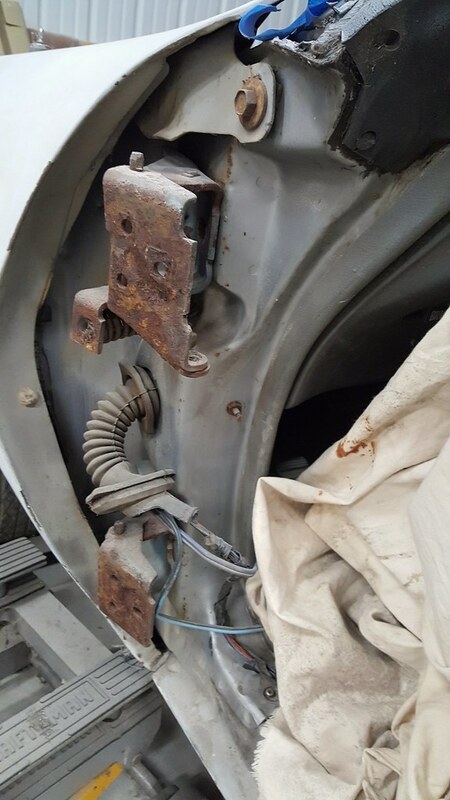 The hinges were painted a light blue, very similar to early motor colour, after cleaning better the screws for the doo latch were painted the same colour. I havent dug into the pass side yet to see what they look like. Bob, the sem number is 15183 for the warm grey. That's the lighter colour. I checked it with an original piece I cleaned and it is spot on for match. I got all the sem at a local auto part store. They had to order in the darker grey for the dash but it only took a day. I did get spray bombs from Auto touch up and their colours were exact as well. Thanks for the recommendation. Against my better judgement I bought the same in a quart and will use that with my air gun to spray the top. I say that because im not sure about using a one part paint, but figured i would give it a shot. I want to make sure the finished appearance is as close to original as possible. Gonna try to get some clear today so i can paint tonight. Paint was put on temp hold until I got more stuff ready. 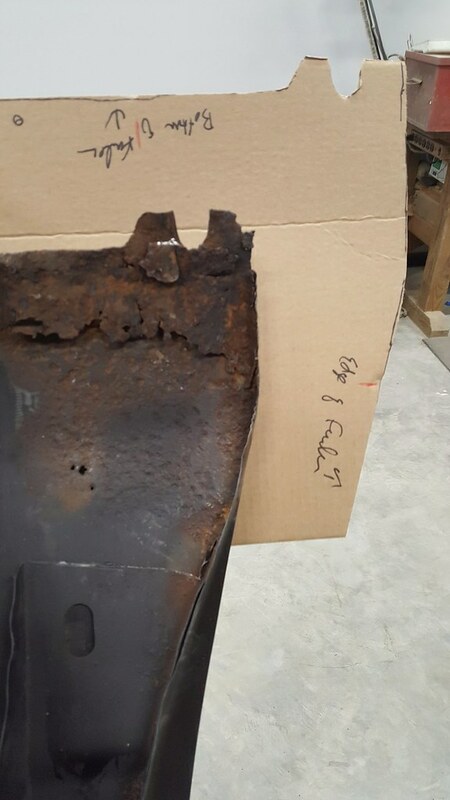 I removed the windshield, cleaned up the channel which like the top had zero rust. Got the dr. side fender off, cowel dropoff and bottom are solid. 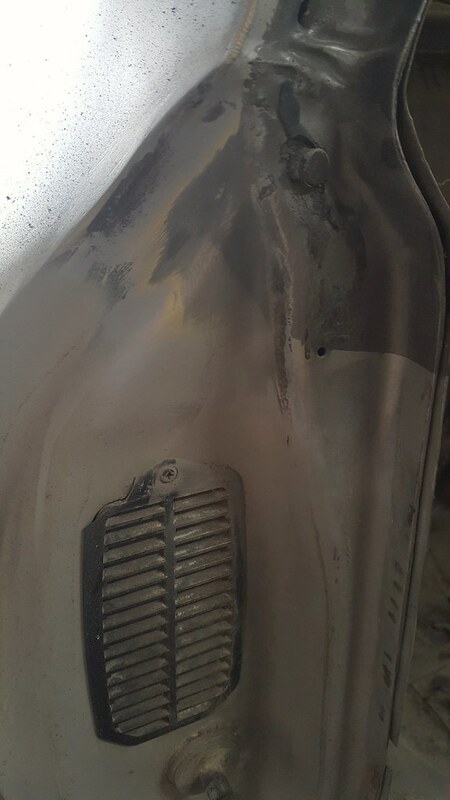 Bottom of fender has the typical rust, but I think I can repair it easily enough. 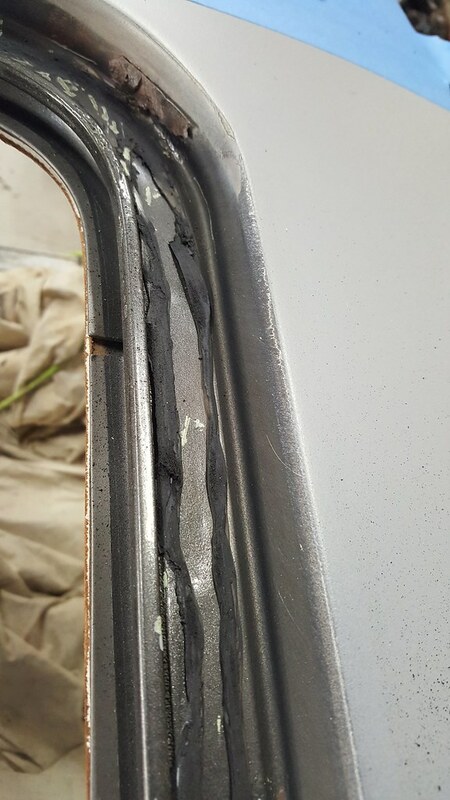 Also, gonna try to restore the cracked dash in place, I really dont feel like pulling it out! 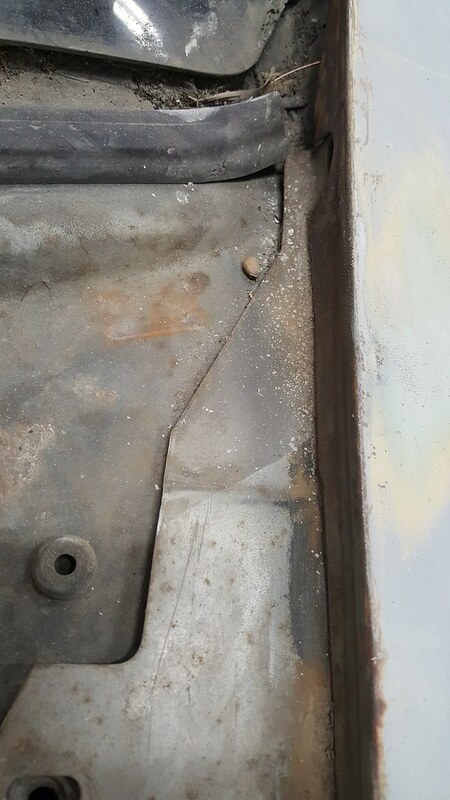 I was hoping to save the paint on the metal part of the dash but it has some very slight surface rust in a couple of places and some scratches so I will sand it down and repaint it as well. So much progress, so little time. Definitely worth trying to restore the dash in place, especially with the windshield out of the way now. 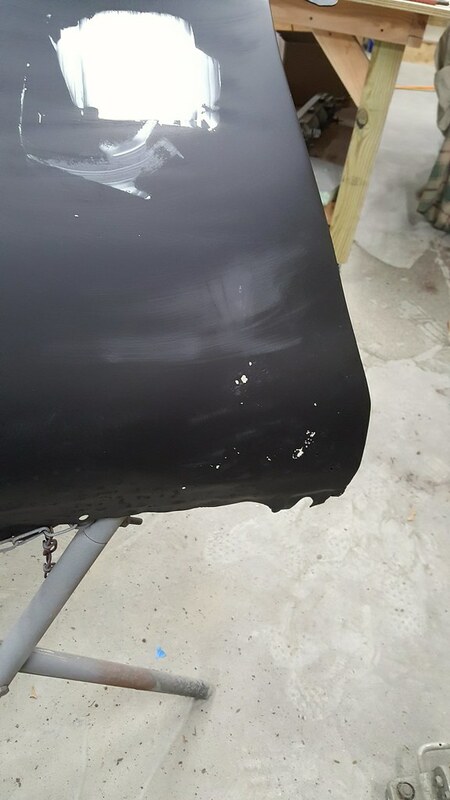 I got the fender sanded down last night, it is darn near perfect, no rust and not a dent one, at least no rust on the top!! The bottom is bad behind the wheel, typical for these. There mustve been about 5 lbs. of crud that came out from inside there when I took it off. Theses should have had a cut out on the bottom to let crap out! Also, the rocker on the dr. side is crushed a bit. Again it looks the typical 'lets put the jack under here' kind of thing. 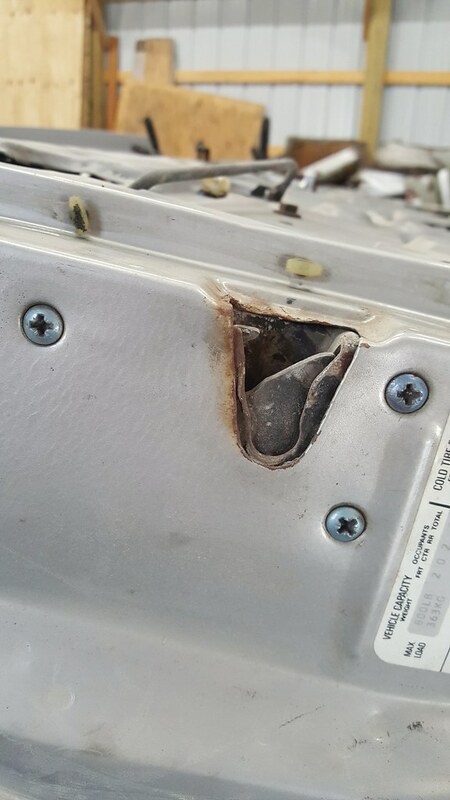 Still not sure how to best repair that part. I hear you on the lower quarter full if junk. It's open to the trunk too so whatever dirt and who knows what falls in there it stays. I had a couple wrenches and a 5 gallon bucket of sand fall out of my Formula. That's just ballast for launching! Those look pretty bad. In my case I was referring to the front fender. The quarters are really nice. I did get the fender epoxied this afternoon (just walked in from the shop actually). Hope to get the patch work done over the weekend. I ended up replacing the most of one quarter and all of the other quarter on that car. This is the most amount of rust I have found to date. Again, fairly typical for a firebird. 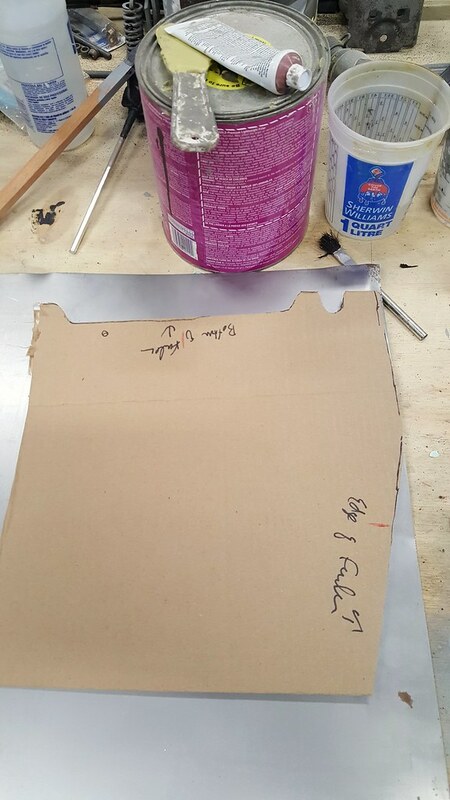 I made a cardboard template, then cut out a piece of metal, overlayed it on the bad spot, marked and cut it out. Then I patched a new piece back in. 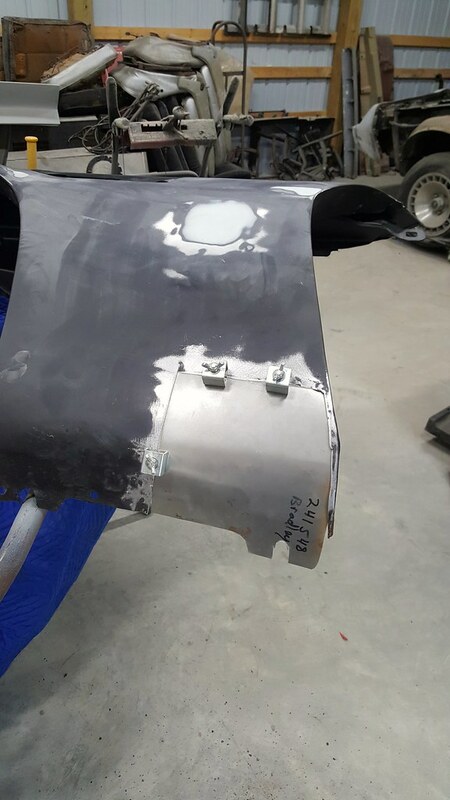 Patch held in place with welding clamps ready to be attached. I then did the same thing to replace the inner structure that was rotted as well. I thought I got pics but guess not. That looks like a great repair job! Excellent work for sure. Thanks, I bought the lower fender patch panels when I did my 77 but they barely fit and still had to be tweaked a good bit. I found it just as easy to buy some sheet metal and make my own this time around. But WOW! that stupid piece of 2' x 2' metal cost almost $30 at lowes!! Im sure I could have found it cheaper somewhere but that's where I was. 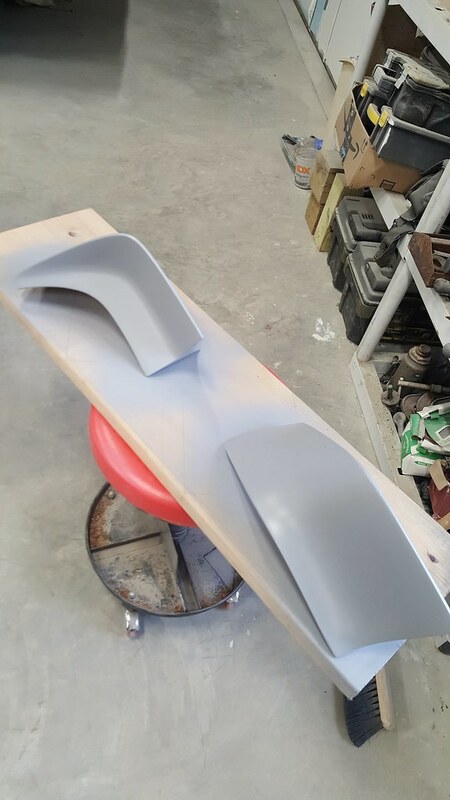 I keep everything so I have fenders and hoods and floor patch pieces saved just for projects like this. But, then again, I'm a parts hoarder... BTW, looks very professional, great job. I had lots of scrap metal stuff laying around that I either saved from jobs or salvaged, but that was all lost in my fire. I dont discriminate with parts, I hoard everything, LOL! Luckily my wife throws stuff away if she hasn't touched it in a week. It is a good balance between that and me being a packrat. Otherwise you might see me in a tv show. Should make a run to your local pick n pull for some hoods to make for some cheaper sheet metal. That's a good idea box, I used to do mostly commercial and industrial construction. There was never a shortage of scrap metal to grab a hold of. Now that im doing home improvement/residential stuff that source has dried up. I had planned on getting some paint on by know, but priorities had me going to a car show on Saturday and sunday was raining too hard to paint. Karate class tonight will put me off another day. Maybe by the end of the weekend.